Welcome to Prepaid Phone News' regular Sunday Prepaid Phones on Sale this Week post listing the best US prepaid phone deals in one place. My Deal of the week is the refurbished Motorola Moto G for PagePlus or Verizon for $74.99 from eBay seller yapper_wireless. These are Verizon prepaid Moto G's that have supposedly been active on Verizon Prepaid for 6 months and thus can be activated on other Verizon MVNOs including TracFone and Page Plus without flashing. I was initially skeptical of the seller's claim that the phones would work on PagePlus. However, several HowardForums users have purchased these phones and successfully activated them on TracFone and PagePlus. The seller offers a 60 day warranty so if it doesn't work you can get most of your money back (the buyer does have to pay return shipping). While it's still possible to flash a Boost Mobile Moto G to PagePlus that won't work with TracFone and PagePlus is rumored to begin blocking flashed non-Verizon phones in December. Because these eBay Moto G's are Verizon phones, activating them on PagePlus should continue to work even if PagePlus blocks non-Verizon phones. AT&T Nokia Lumia 635 LTE Windows Phone $79.99 (reg $99.99) at Amazon, Walmart and Radio Shack. Verizon (also works on Page Plus) Nokia Lumia 822 LTE Windows Phone 8 for $94.99 at Amazon (was $329.99). NET10 (online only) Free overnight shipping of all SIMs and phones priced at $19.99 or more (ends 12/19). Not all phones are available in all areas. RadioShack Shipping $6.99 Free ground shipping on orders over $25. Free Ship to Store. Straight Talk (online only) Free overnight shipping on phones $29.99 and up (ends 12/19). Not all phones available in all markets. Target free shipping on all orders now through Dec. 20. 5% off and free shipping on all orders with Target Red Card. Tracfone (online only) Free overnight shipping on orders of $19.99 or more (ends 12/19). Not all phones available in all markets. 30% off all AT&T GoPhones with Walgreens Balance Rewards loyalty card. Updated 11/14 New Cricket and Cowboom deals. Dennis, do you know if net10 T-Mobile powered phones will work on regular T-Mobile? I know the net10 optimus extreme works with the at&t byop Sim in both net 10 and straight talk (with an APN change). NET10 phones are locked and generally don't work with other operators. As you mentioned, there are exceptions where a Straight Talk BYOP SIM sometimes works in a NET10 phone and vice versa. But I've never heard on a NET10 or Straight Talk phone working on T-Mobile proper. 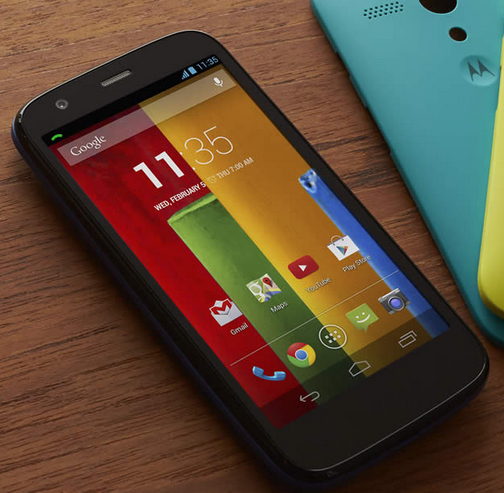 Will the above refurbished Motorola Moto G also work on Selectel? Thanks! It should, but I haven't heard of anyone trying it. Thanks Dennis, I was looking for something on the cheap to tide me over until I can afford the G3. Just an FYI, the Exceed 2 is now 49.99 at Best Buy. Dennis, or anyone, if I unlock a Cricket Moto E now will the eventual upgrade to Lollipop turn it back into a locked phone? Thanks! Is the Consumer Cellular Moto G a GSM phone? And will it work on GSM based MVNOs? Consumer cellular uses at&t's network, yes it's GSM. Yeswap Consumer Cellular has the cheapest GSM versions around Moto G 1st gen 3g is $100 and 2nd gen the newer one is only $150 the real question is do they come unlocked? I wanted to use the 3g version for H20 pay as you go internet 3g mainly. Do you know Yeswap? Also to Anony I was in Target today they only had the cheap duro phone and Ascend 2 didn't see any other phones. And if you buy online they might try to force you to get a plan but then again you might want Consumer I had it before it was big its a good company. I've heard that the Consumer Cellular Moto G's are locked to Consumer but there are supposed to be $2 unlocks on eBay that work. How about the Brightspot ZTE Zinger from Target for $9.99 in their Toy Ad? Folks have said it's locked to Brightspot, but I took the ad to Walmart and had them price match it, and they allowed me to buy the T-Mobile Zingers for $9.99/each. It's dual core and runs KitKat. 512 mb RAM. Nothing spectacular, but it's $10. I see the "pickings" this week are on the slim side, I'm sure it's the "quiet period" as we get close to Black Friday. 1) Available right now at Best Buy is the AT&T LG G Flex 4G LTE Smartphone (with the curved screen) for $199.99. When you add the phone/device to the cart, it says $1.00, with a two-year contract. Select "Add to Package", then click on "Buy An Unactivated Device" button, where you will see the price change to $199.99, plus tax and free shipping to home/office or local Best Buy store or Best Buy Mobile location. Others can add their comments if this phone/device is a good deal for $199.99. The quick specs are: Qualcomm Snapdragon 800 processor, 2.26 ghz, Android 4.2.2 Jelly Bean and 6" curved HD OLED touch screen display. Ask your salesperson if he/she can "flatten" the screen for you! 2) Calling all Page Plus fans! Sears (why does this chain still exist?) is offering the Tracfone version of the LG Optimus Fuel for $9.99, plus tax. Remember when Dennis highlighted the StraightTalk version of this phone during the summer of 2014 for $29.99 at Walmart? Now, this Tracfone "triple-net" phone/device can be had again during the Black Friday rumble for $9.99. Sears opens at 6 pm on Thanksgiving Day (some exceptions/locations excluded), and Sears is open all night (why, I'm not sure). I'm sure more of many Black Friday deals to come! Nice find Bells, on the G Flex, apparently it's only available in store, and every zip code I tried said "not available" , I'm really starting to hate BestBuy , the price does look legit and i'd say it's a hot deal for $200, let me know if your area even has it. Hells, AT&T's online still has this phone for $299.99 ON CONTRACT , and $634 un activated, heck even Best Buy's Sprint G Flex is $750 un activated! As I posted this last night, it was available at several Best Buy locations (traditional and Mobile) for in-store pick-up as well as delivery in the greater Los Angeles area. My hunch is that many caught wind of this "deal" and latched on to it. Knowing Best Buy, my experience is that once an item shows "not available", in a few days the item is back in stock, so we'll see if the non-contract price of $199.99 holds. Regarding the AT&T LG Flex, the Slick Deal website found them, of course they are sold out nationwide now, and naturally they had to get at least 2 or 3 each! UPDATE -- ShopCellDeals has just corrected the mistake on his website. The Tracfone LG Ultimate 2 with 1200 minutes/text/data price has been changed to $199.99, and the price of the phone with 600 minutes/text/data remains at $149.99. Added to the post, thanks for the tip. slim pickings this wk. look forward to more black friday deals. Hopefully more gsm lte models. Kroger has the TracFone LG Optimus Fuel 34C for $19.99. I bought one just to check it out and set up my Google account with Wi-Fi only. Google auto-installed all the apps I had downloaded on my other device and it seems to work great un-activated. I still haven't decided whether to activate it yet since I like my other Tracfone. In southern California where Kroger operates the Ralphs Grocery Company and Food 4 Less banners, I checked two locations, one a Ralphs Fresh Fare, the other a Ralphs Marketplace. Both locations were offering the LG Optimus Fuel 34C phone/device for $19.99, however, it was for use with Net10. Neither location had a LG Fuel for use with Tracfone. Has anyone attempted to activate a Net 10 LG Fuel for Tracfone and/or Page Plus with success? Maybe Dennis can check to see if FoodsCo (another Kroger banner under Food 4 Less) locations in the San Francisco Bay area are also offering the LG Fuel, and whether that phone/device is for Tracfone and/or Net 10? Let's Go Krogering......For The Best Of Everything!!! Other Kroger banners throughout the United States include Fry's, Smith's, QFC, King Sooper, Fred Meyer, Dillon's, Gerbe's, City Market, Baker's and most recently Harris Teeter just to name a few. I bought my 34C at a Kroger in Indiana. I checked yesterday and they still have them for $19.99. The clerk, interestingly, didn't know where the key was or where the phones were kept, indicating that there is not much demand here. I activated mine last weekend with Tracfone and ported my minutes from my other Tracfone.